This Scratch simulator allows you to quickly check how changing the linkage's bar lengths affect the path it draws as the crank is rotated. 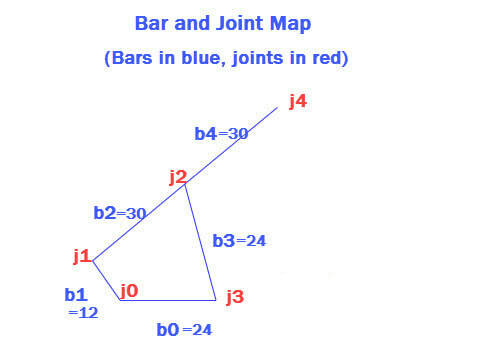 The bar map below shows 5 bars, b0 thru b4, but since the angle between b2 and b4 is fixed, j1 thru j4 is considered a single bar. Also, the frame functions as a bar of the linkage, with frame connections j0 and j3 creating bar b0. Below is an embedded Scratch simulator. You can also run the simulator on MIT's site where you can modify the Scratch code. After changing a bar's length, click somewhere other than a slider bar and then press the space bar to see the new linkage, and use your keyboard's left/right arrows to rotate the crank. ​​A description of the algorithms, and how we used them to simulate linkages, is here.